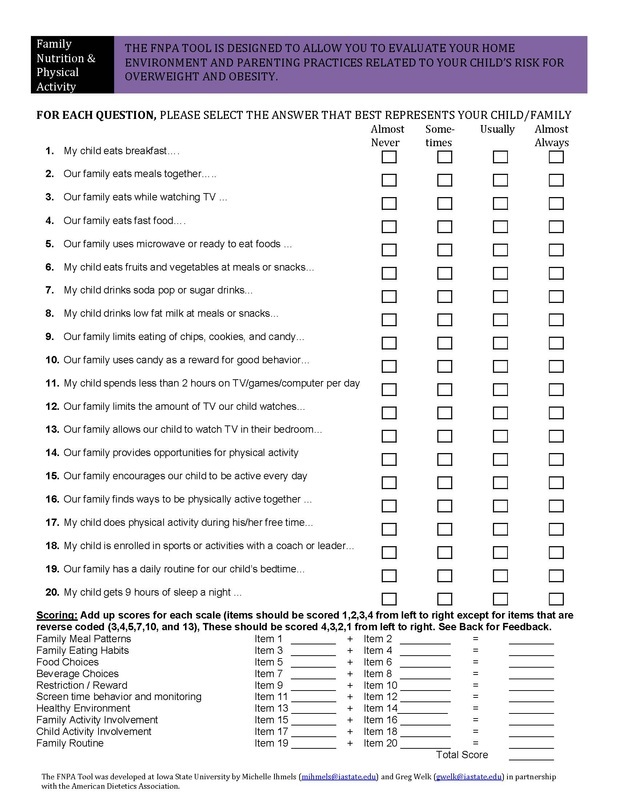 The FNPA tool is an online screening tool designed to evaluate home obesogenic environments and parenting practices that may predispose youth to becoming overweight. The FNPA tool was developed in collaboration with researchers affiliated with the American Dietetic Association (now called the Academy of Nutrition Dietetics). Validation work was conducted by former Ph.D. student (Michelle Ihmels) and members of our lab have continued to explore the utility of this promising behavioral tool. Current Ph.D. student (Karissa Peyer) and M.S. student (Kim Klimesh) lead this work. Click here for details on the development and validation of the FNPA tool and other research studies by our team. We are conducting formalized cognitive testing of different versions of the tool. We have targeted adults from several schools in neighboring school districts to participate but if you are a parent of a child in K-3rd grade we welcome your participation. Please click on the link below and we will contact you to fill you in more on the study. The FNPA tool provides a useful tool to evaluate home obesogenic environments. There are a number of ways to access and use the FNPA tool. We worked with the Academy of Nutrition and Dietetics developed a powerful online tool to facilitate utilization by dieticians and clinicians. A colleague at Geisinger Health Systems (Lisa Bailey Davis) has incorporated the FNPA directly into a parent portal to allow it to be incorporated into the EPIC-based electronic medical record to facilitate physician counseling. A colleague at Blank Children's Hospital (Julia Richards-Krapfl) has worked with our team to use the FNPA to facilitate weight loss counseling for parents of overweight children in their clinic. The FNPA was developed to facilitate research and behavioral applications to help address childhood obesity. The current FNPA tool has had good utility but we are currently conducting cognitive testing and some item analyses to test alternative wordings and formats for the tool. The changing nature of technology and society has also necessitated changes in some items. This work is currently in progress. We have established an FNPA user group to provide a way to facilitate sharing and collaboration on the FNPA. Complete this form if you would like to join our FNPA user group and collaborate on this work.